Whether it’s replacement windows, siding, doors or garage doors, your installers will make sure your products are properly installed. They’ll work quickly and efficiently to make sure that everything looks and operates as it should. Feldco promises that the installers sent to your home will be factory trained and certified ensuring that they’re the best in the business. You can rest assured knowing that your windows, siding, doors and garage doors will be the most energy efficient and durable in the industry thanks to the installation team. The installers will come to your home on time, quickly and efficiently complete your project and leave your home cleaner than when they got there. The process couldn’t be easier! You’re in good hands with Feldco for your next home improvement project. From homeowners to installers, we make sure everyone involved in the installation process is safe from beginning to end. Whether it’s wearing proper protection or cleaning up after themselves, the installers take the proper safety precautions to ensure everyone’s safe at all times of the installation. We ensure that every installer complies with the Environmental Protection Agency’s standards for Lead-Safe Renovations. The EPA states that any contractor performing a renovation, repair or painting project that disturbs lead-based paint in a building built before 1978 must be certified for the EPA Lead-Safe Renovations and follow specific work practices. 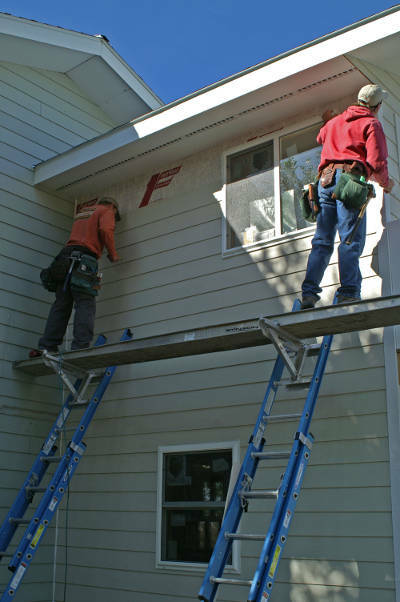 The installation crew that is sent to your home has their Lead-Safe Renovation certification and guarantees that they know exactly how to handle houses with lead based paint. There’s no other window, siding, door or garage door company in Chicago that offers the same mix of high quality products and expert installation as Feldco. Your installers will do everything in their power to ensure your products look and function properly. They’ll install your replacement windows, siding, doors and garage doors quickly and efficiently. Your installers will all be factory trained and certified – including Lead-Safe Renovations. You’ll know that you, your family, your home and the installers will all be safe through the installation. There’s no losing with Feldco. Get a free quote now and join over 350,000 homeowners who have trusted us with their home improvement projects. Copyright © 2017 Feldco Windows, Siding & Doors. All Rights Reserved.